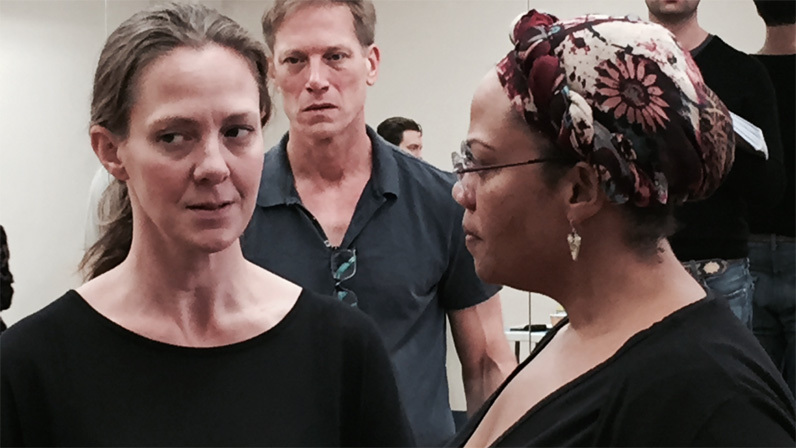 The stars of Bonfire of The Vanities rehearse in New York City last week. Tom Wolfe once came through for Stefania de Kenessey in a big way. It was 1997 and de Kenessey, now professor of music at Eugene Lang College and a leading figure in classical music, was organizing a festival of young artists—musicians, poets, painters, architects—who were “working at the cutting edge.” She called it the First Derriere Guard Festival, “a humorous antidote to the artistic world around me,” de Kenessey recalls. All the artists had signed up; she just needed to enlist a keynote speaker. Who better, she thought, than Tom Wolfe, author of the boundary-pushing books The Painted Word and From Bauhaus to Our House? It was a long shot, but de Kenessey decided to go for it. “Out of the blue, I wrote an invitation to Tom. He accepted—and we have been in touch ever since,” she says. Not only did Wolfe agree to speak at the event; he did it for no compensation. He even sprang for his own cab fare. Now Wolfe is lending his support to de Kenessey once again—this time, by giving her the musical rights to his best-selling work The Bonfire of the Vanities. De Kenessey, in association with Process Studio Theatre, will present the musical on October 9 and 10 at New York’s El Teatro at El Museo del Barrio, 1230 Fifth Avenue. With music by de Kenessey and a libretto and direction by Michael Bergmann, the witty and incisive new opera takes on the ever-present socioeconomic tensions of New York City with high drama and lyrical satire. The story unfolds as Wall Street trader Sherman McCoy (Randal Turner) invents a bond whose popularity propels him to the top of the financial world. But just as he meets the peak of his success, he collides with a scandal that brings all of New York City crashing down upon him, including a ferocious Harlem reverend (Kevin Maynor), his own loyal but cosseted Park Avenue wife (Anne Carolyn-Bird), a sexually ambitious femme fatale (Yingjie Zhou), and an idealistic lawyer who demands better things for her city (Adrienne Danrich). De Kenessey’s score, which is driven by melody and strong rhythms, erupts from an 18-piece orchestra and brings together elements of classic opera and popular music to create a unique blend that echoes both the contemporary concerns of the narrative and the deep emotions of its characters. Judging by the score, it wasn’t merely de Kenessey’s personality that won Wolfe over. Fifteen years after their first meeting at the First Derriere Guard Festival, the composer and the author again crossed paths: de Kenessey was the composer-in-residence at the Bridgehampton Chamber Music Festival, which opened its season with a performance of de Kenessey’s flute concerto, and Wolfe was in attendance. In the weeks after the performance, de Kenessey and Wolfe discussed the possibility of collaborating on a project. De Kenessey proposed creating an opera together, and Wolfe, in principle, agreed. The hitch? The author didn’t know a thing about writing an opera liberetto. But de Kenessey, who hoped to seize yet another opportunity to work with Wolfe, had a solution.